You'll love the charm of this tiny, detailed, captivating design. It's vintage feel is right at home in any tradition-loving holiday decor. 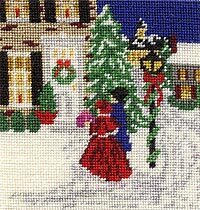 Boxed kit contains everything you need: 40-count framed silk gauze, stitching needle, Kreinik Silk Mori to stitch the design and complete instructions.